You can generate optimized routes for autonomous vehicles in order to send the orders right to the clients' doorstep. The Autonomous vehicles (AV) use a combination of sensors, including lidar (light detection and ranging), radar, cameras, ultrasonic, and infrared. For locationing, the AV can use a combination of the Global Positioning System (GPS) and inertial navigation systems (INS). When using the AV fleet for the delivery, the role of vehicle to vehicle (V2V) and vehicle to infrastructure (V2I) communication is important. That can be done only through the reliable software and services. 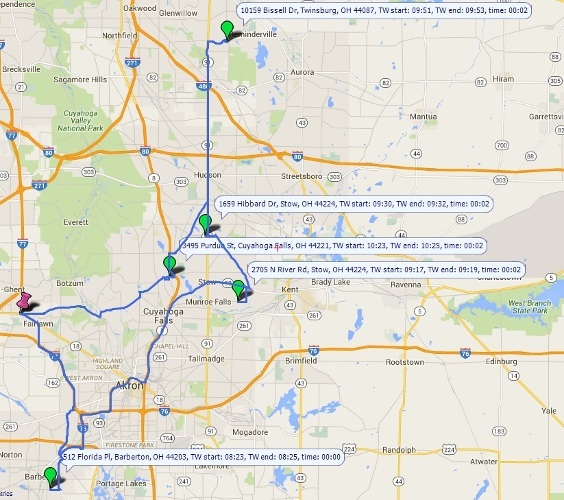 You can use Route4Me API for routes optimization for the AV and adapt it to AV's internal and external software. For example, you can use custom data parameters for storing commands for different business cases. Particularly, for example, an AV will open the baggage compartment only if someone will enter or say specified password. And this password you can store in the custom data. Or an AV could be equipped with portative printer for printing information sheet for customer (delivery time, latest news from the supplier), The AV can send information to supplier's database about delivery or problem with triggering specified processes. The AV can be equipped with a terminal for entering new orders etc. Also, in case of AV fleet it's important dynamically construct the avoidance zones and geofence, triggers, use latest environmental data (rain, snow) etc. The latest big story in the autonomous vehicle industry is the development of shared autonomous vehicles (SAV) for public transportation. Preliminary results indicate that each SAV can replace around nine conventional vehicles. Peter is at home and wants to go to his office but there is no SAV containing such route. Peter has to leave home with one SAV and move to another SAV at 10159 Bissell Dr, Twinsburg, OH 44087 to get to his office. Fleet management takes Peter's route into consideration and plans multiple routes such way that Peter could lose least time possible when waiting for another SAV. Let's to construct an optimized route with the time windows for John, David, Mary, Liza and Peter. 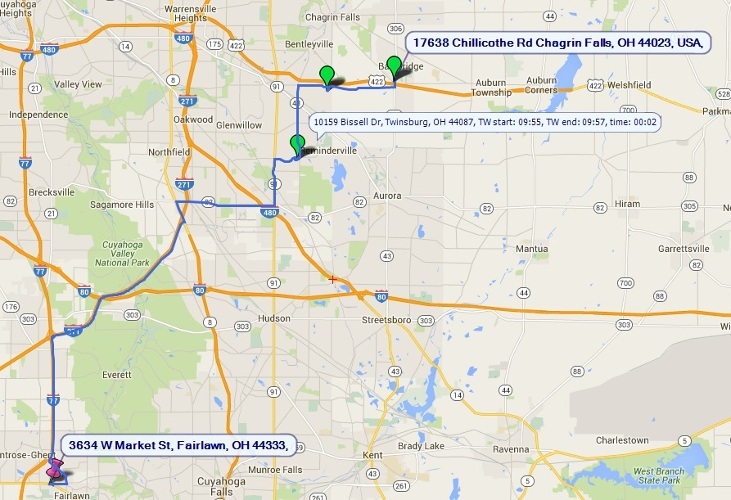 As for Peter, he needs second route for transporting him to the address 17638 Chillicothe Rd Chagrin Falls, OH 44023, USA. In Route Parameters you can define the vehicle_id field. Set it to FFFF72BF6E06DC3C746673279BDAAE05 (This is the ID of one of the vehicles used in Route4Me's test account database). The system will send a RESPONSE with an array of the addresses, which belongs to one round-trip route. You can add custom fields with custom values to an address. Particularly, you can add a password as a custom data - autonomous vehicle will open the baggage compartment only if someone will enter or say specified password. Let us add a password as custom data to the address 3495 Purdue St, Cuyahoga Falls, OH 44221 with route_destination_id=208797874. 13 curl -o file1.txt -g -k -X PUT -H "Content-Type: application/json" -d "@update_address_custom_data.json" "%url%?api_key=%apikey%&route_id=%routeid%&route_destination_id=%routedestinationid%"
See sample response data (see here). Now only a person who will enter or say to AV "open sesame" can get an item delivered by AV. Let us add a note that contain a pdf file with product catalog (national flags), which AV can print or share to passanger's device after the item is delivered. 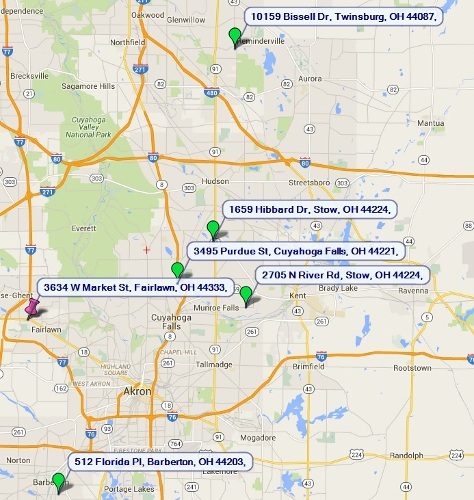 Let us add this kind of note to the address 512 Florida Pl, Barberton, OH 44203 with route_destination_id=208797872. 15 curl -o file1.txt -g -k -X POST -F "[email protected]%filename%" "%url%?api_key=%apikey%&route_id=%routeid%&address_id=%addrid%&dev_lat=%dev_lat%&dev_lng=%dev_lng%&device_type=%dev_type%&strUpdateType=ANY_FILE"
The passanger can find the product catalog at this address. 11 curl -o file1.txt -g -k -X GET "%url%?route_id=%routeid%&api_key=%apikey%&route_path_output=%rpo%&notes=%notes%"
Get Generated Route Details (Script file, RESPONSE data). Let's say central AI dispetcher got new order from passanger and it added new order to the database. See sample INPUT data (see here). 9 curl -o file1.txt -k -g -X POST -H "Content-Type: application/json" -d "@add_order_data.json" "%url%?api_key=%apikey%"
Now central AI dispetcher can decide which route is most optimal for already created order and insert it into this route. Pay attention that you can put into the address object only order_id parameter. 11 curl -o file1.txt -k -g -X PUT -H "Content-Type: application/json" -d "@add_order_to_route_data.json" "%url%?api_key=%apikey%&route_id=%route_id%"
The order for new passanger was inserted into the route.